Yesterday, I had the opportunity to attend some of the Micro/Macro conference hosted by CAPS (Canadian Association of Planning Students) which took place between the four universities. A representative from Bixi, the public bike-sharing program set to be launched this spring gave a presentation (which I unfortunately missed) on the project. As everyone lined up for lunch, one of the bikes were rolled out for everyone to have a look at. Unfortunately, I didn’t have time to take any close-up shots of the different parts of the bike but was glad to be able to take a good look at it. The bike, designed by Michel Dallaire Design Industriel (also responsible for much of the furniture in the Grand Bibliothèque as well as much of the urban design of the Quartier International) seems to be very well built and designed. The bike is incredibly simple and obviously made to be very rugged with all delicate parts such as the brakes and derailleur encased in plastic or metal to keep them from being damaged or tampered with. I was however, surprised by how heavy it was and by the fact that it has very wide tires rather than thinner tires that are generally much better on city streets. This design will inevitably cause the bikes to be much slower but perhaps that is the rationale behind the design. Nonetheless, I was very impressed with the bike and look forward to seeing them on the streets this summer. Also, this map (below) of the future station locations has been posted on the Bixi website. Click the map to see a larger version. I really hope that they improve the front basket (I made suggestions about this months ago) – it is really not very practical. One might be able to hold a large bag in it, but if fails the baguette and beverage test miserably. I was at this talk too, and took a few pictures of the bike for the Vancouver blog I write for – but obviously missed the best opportunity when the bike came out into the hall after the talk. Evidently I also missed the opportunity to meet you in person! Would you mind if I post your picture on the nascent Vancouver student-run planning blog http://www.planningpool.org, with a link to Spacing Montreal? Your picture is just SO much better than mine. I was at the conference and what was pretty interesting is the fact that the this bicycle is unique. In the sense that the parts can only fit that model, so if people try to steal parts, they can,t use them on another bike. Looking forward to see the bikes in the street this summer!! Well, thieves have managed to make off with the original Parisian Vél’lib bikes, also designed with parts that don’t fit other bikes – think they have wound up in distant countries. They are heavy, but I don’t find they are quite as heavy as they look. (I did pick one up, when they were being shown at the Jean-Talon Market in the autumn). Think the high rates charged might be more of a deterrent. Still, anything to get more people cycling is a good thing. I really like the look of these bikes, though – as Zvi says – that front basket is mostly decorative. It “evokes” utilitarianism without really being very useful. Though I should add that it’s sort of dangerous to carry too much weight on the front of the bike. Maybe a rear box-type panier would have been more practical. Two features I really like about the BIXI program are 1. That it will displace a lot of parking places and 2. That it will bring a lot of novice cyclists onto the bike network (thus forcing drivers to be extra careful – if they can find parking). A stealthy mountain is a sneak peak. A preview of something not widely seen yet is a sneak peek. Thank you grammarian, you are quite right. The bikes are a “nice ride” and handle easily. They might be the “peak” of self service bicycles! Wow! I’m really surprised by the ambition of scope. It looks like these things will be available every few blocks. Is that really true, there will be stations where each of those red dots are? Very cool. 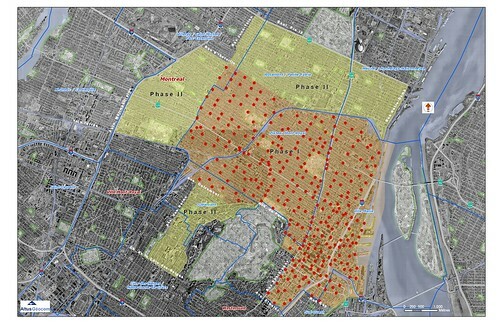 @walkerp: I’ve seen the detailed list of locations that have been requested in the Plateau-Mont-Royal borough (I work for the borough mayor) and can confirm that the image you see here is the real deal. Of the 70 or 80 sites in our borough, only one is problematic and will surely be replaced a block over or something like that. The rest were, after a preliminary study, judged to be OK.
One of the more interesting ideas with the Bixi system is that the bicycle stations are designed to be free-standing and modular. Thus the stations can be moved around and expanded/contracted as necessary. I am still very concerned with their pricing model though, and it is not clear to me who exactly their ‘target market’ is. 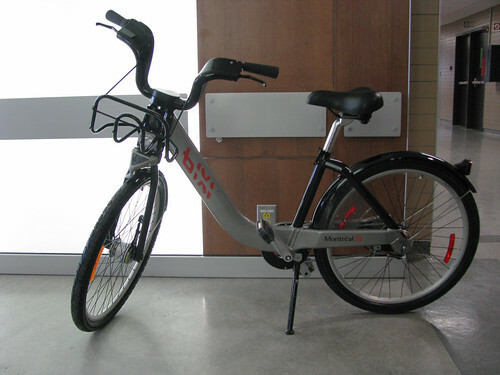 I actually suspect that Montreal’s Bixi may be serving more as a test-market for various Quebec technologies than as a serious attempt at providing mobility alternatives in the city. The government has stepped in to encourage the development of the various system components by Quebec companies, but they are refusing to subsidize the on-going system costs and are not permitting any private companies from running the system in exchange for advertising rights. It would seem that the long-term goal is more to help Quebec companies to develop their export markets than to provide Montrealers with a true transportation alternative. A similar business model was used “successfully” (depending on one’s point of view) for the Metro with Bombardier…. I cannot fault the Quebec government for wanting to encourage certain industries, especially bicycle and ‘green’ related ones, but I do wish that they would also make more of an effort to do what is best for their citizens! Nonetheless, I certainly do hope that Bixi will be a success.